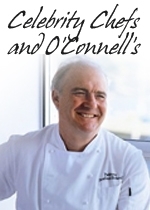 With over thirty years’ experience as a fishmonger in Cork’s world-renowned English Market, Pat O’Connell is well known both at home and abroad. In The Fishmonger, he paints a vivid picture of the trials and triumphs of life as an English Market trader in a highly competitive and ever-changing environment. He describes the devastation faced by the market traders in the wake of raging infernos, their struggle for survival in times of recession, their battle against strong competition and their eventual path to success. In great detail, he recalls the historic visit of Queen Elizabeth II to the English Market, which left a lasting impact not only on the market itself but also on his own life. 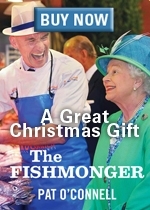 A heart-warming story, with tears and laughter along the way, The Fishmonger gives a memorable insight into the lives and personalities of the market traders, their families and those connected with the legendary English Market. 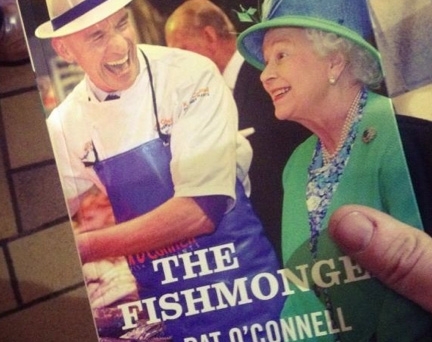 “One of the first fish to catch the queen’s eye was a large monkfish and the queen was quick to ask what it was. Now, in Cork we sometimes call this the mother-in-law fish. But this was about a week after the royal wedding of William and Kate. So, because of the person I was speaking to and because the world was looking on and because I was in some ways representing the English Market, the city and the fish industry, I had to be diplomatic, didn’t I? You must be joking, boy! Born in Cork, Pat O’Connell comes from a family steeped in business tradition on both sides. He was educated at Coláiste Chríost Rí Cork and at Cork Regional Technical College, from which he graduated in Business Studies. After working as an official with Cork Corporation, he took up employment at his mother’s fish stall, Kay O’Connell Fish Merchants, in the English Market in Cork. Today, in partnership with his brother, he runs the award-winning fish stall as well as an oak-burning smokehouse in Bandon. An active member of the Market Traders Association, Cork Business Association, Good Food Ireland and Retail Excellence Ireland, Pat became famous all around the globe when a photograph of him laughing with Queen Elizabeth II became one of the most iconic images of the monarch’s historic state visit to the Republic of Ireland in 2011.